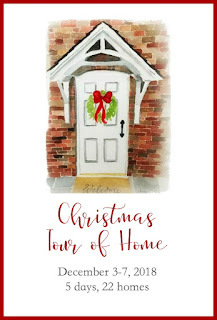 I'm honored to be joining a talented group of ladies to showcase our homes at Christmas time. You will find the list and links to all the homes at the end of this post. Welcome to our humble little cottage. 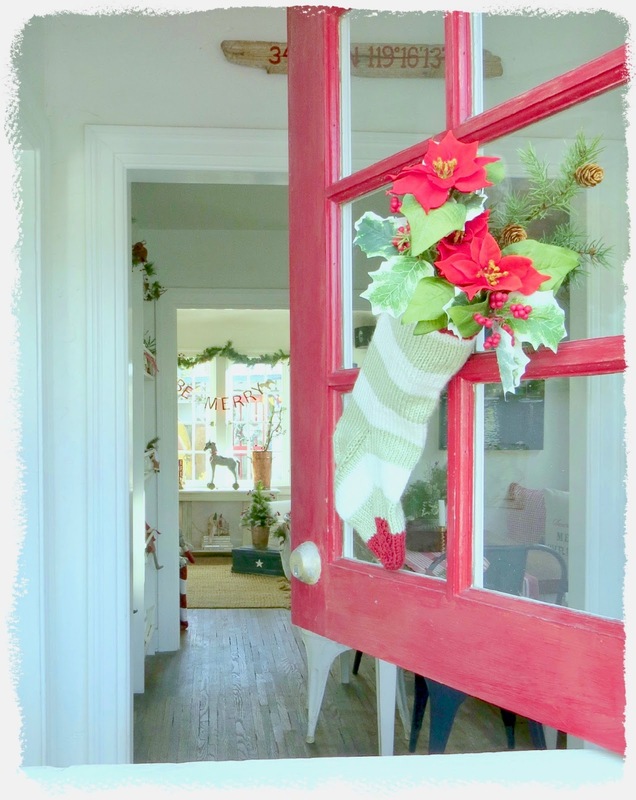 I love decorating our home any time of year, but our white house and red door make our cottage feel like it was made for Christmas. and it's one of my favorite spots in the house to decorate. 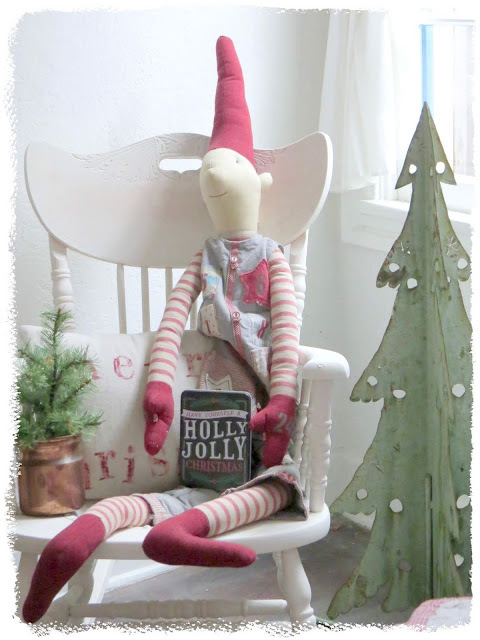 The chippy red chair, a recent find, is perfect for a Christmas house. My numerous Maileg pixies are an homage to my Scandinavian roots - read here about the history of the pixies or as they are called in Norway, Nisse. but there are of course pops of red. As you can see, the red dishes ended up in the kitchen. 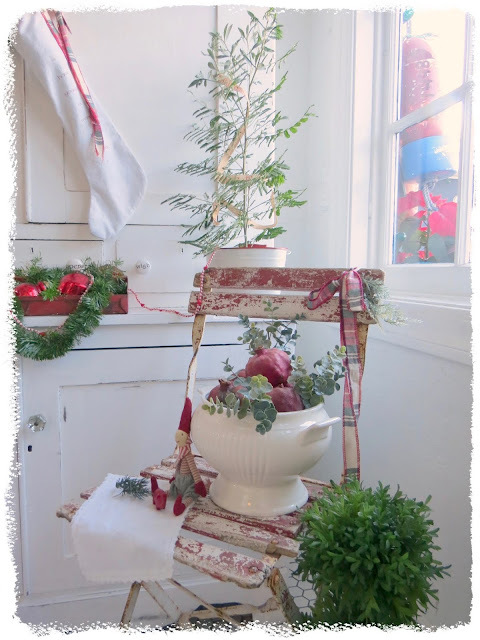 I moved things around the house this Christmas - like the grocery cart holding a little faux tree I bought in 2003. 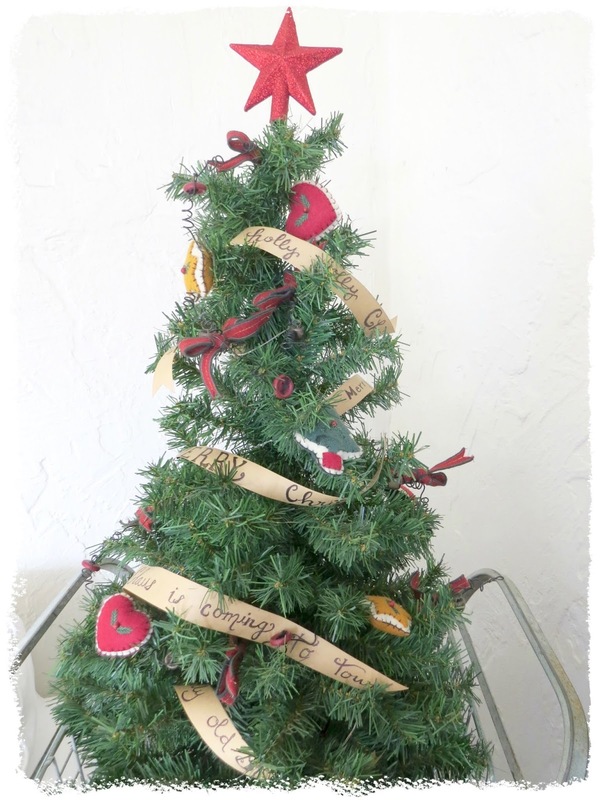 No ornaments for the tree this year, just a felt and wire garland that is over 30 years old and strips of paper with carol lyrics for an upcoming Merry Musical Christmas blog hop. 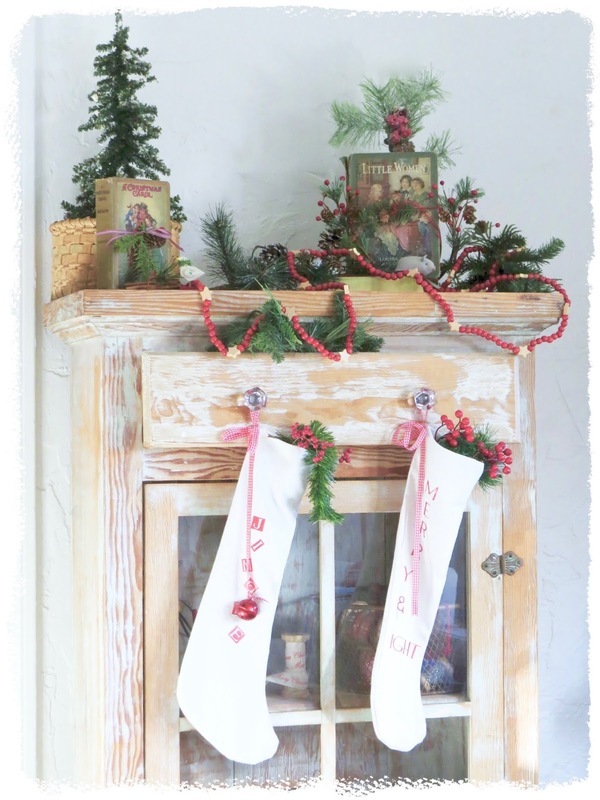 New stockings I made from drop cloth hang on a cabinet. My favorite treasures on the cabinet are my aunt's 1927 edition of A Christmas Carol and my mother's 1926 edition of Little Women. 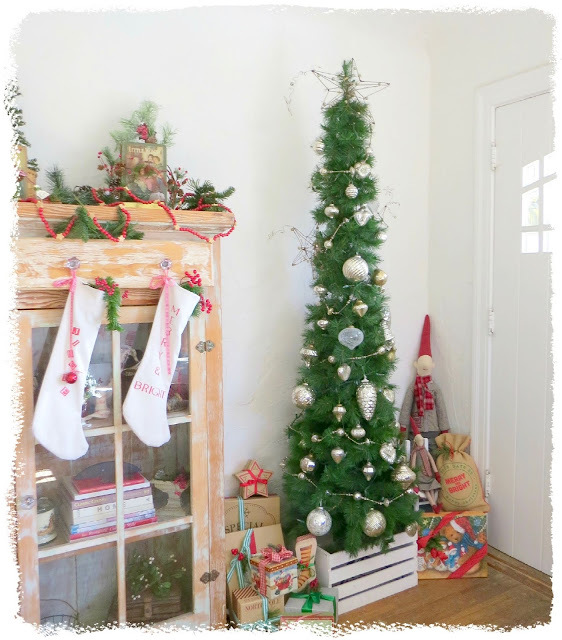 Our faux pencil tree (perfect for our tiny cottage) got a totally different look this year. 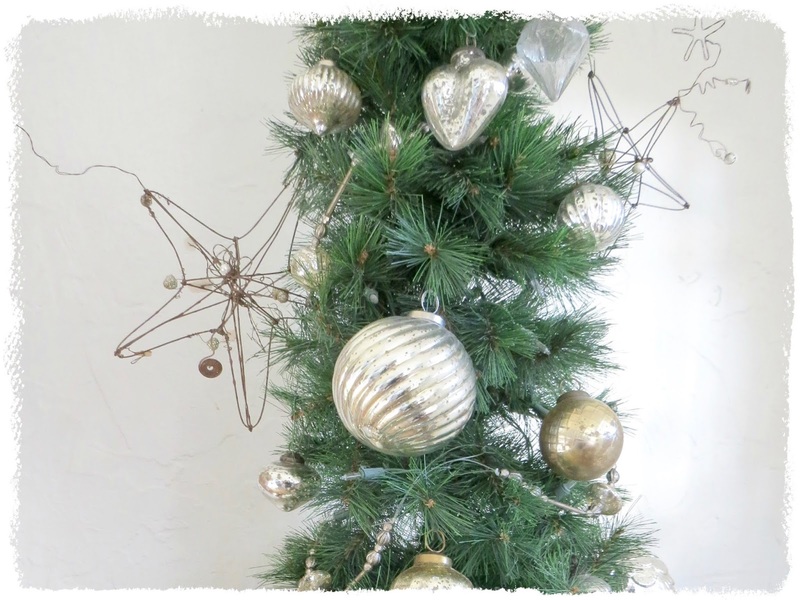 but this year they are all on the tree along with my treasured wire stars. I don't usually do green, but I love the way it pops off the fireplace I painted white last summer. When not in use, our television hides behind a sign - I painted over an Emerson quote for Christmas. I limited decor in our bedroom to a little tree for Steve's sake, he gets a bit overwhelmed by my Christmas enthusiasm - I did not even think about putting any Christmas decorations in his studio. One of the swaps I made was to remove a cabinet from the hallway and exchange it for a simple drop leaf table that Steve found in my parents' garage over 40 years ago. Without the tall cabinet, I love this view down the hallway to the guest room, but I have a whole new appreciation for those of you who live in gloomy rainy places because I struggled to get a decent picture on a rare rainy Southern California day. 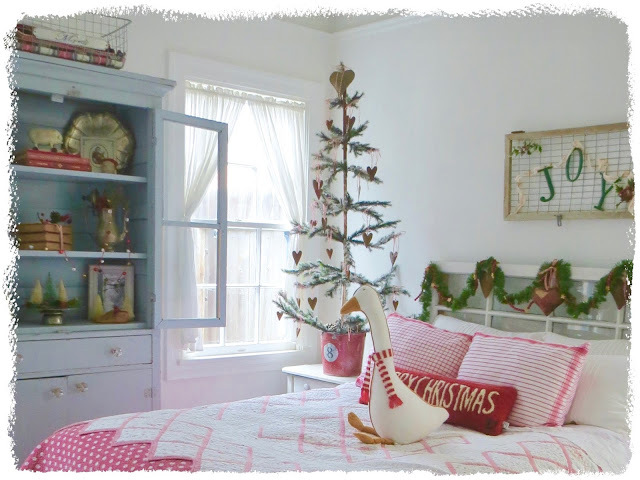 The guest room is one place where I go all out for Christmas. The blue cabinet is new this year and a perfect spot for Christmas decor. 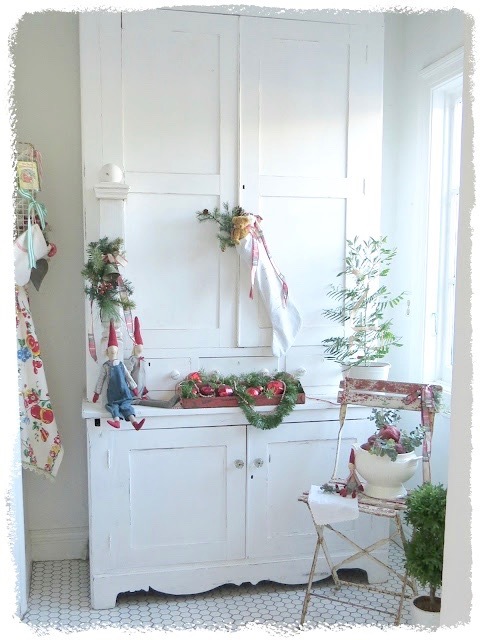 I moved my vintage hospital cart from the living room and gave the old door a fresh coat of paint. but Olaf, my first pixie, needs friends. Thanks for stopping by our little cottage. And now, it's time to visit the other houses on the tour -you are in for some fabulous inspiration. What a heavenly place to be at Christmas! Thank you for sharing it! It is my dream to have a little cottage and to decorate it like this! Carol,this is simply and perfectly beautiful! Merry Christmas friend. Always beautiful! 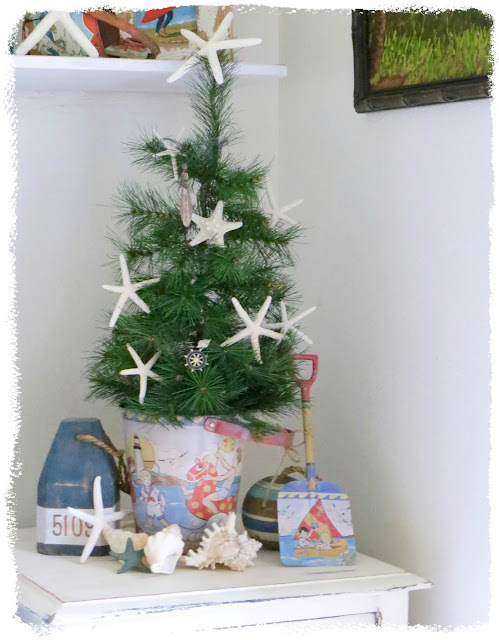 I think Steve should paint a scene of your beach with a beautiful Christmas tree in the surf. I just love your Pixie's. I'm going to try to carve out some time to try my hand at sewing a couple. They may not be ready for this Christmas though. Thank you for sharing your beautiful, dreamy home. 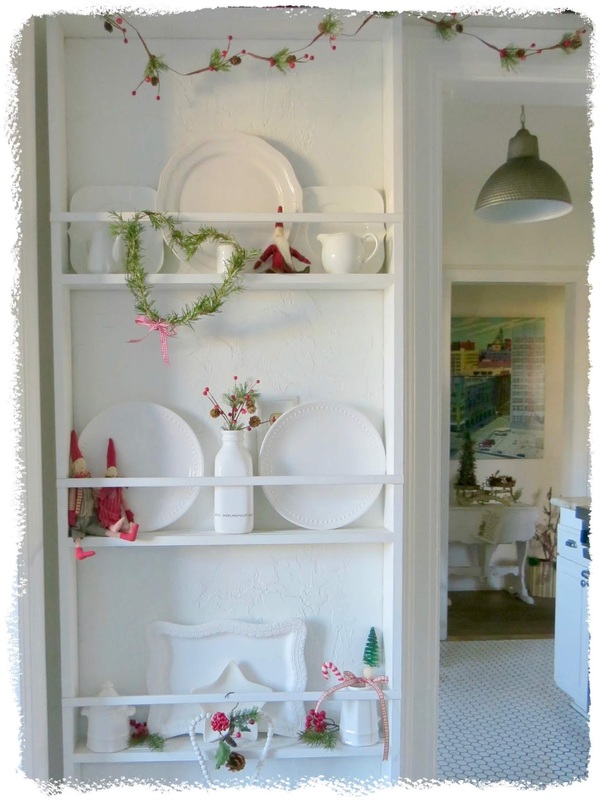 I just love all of the white you have in your home. You can add practically any color and it pops! 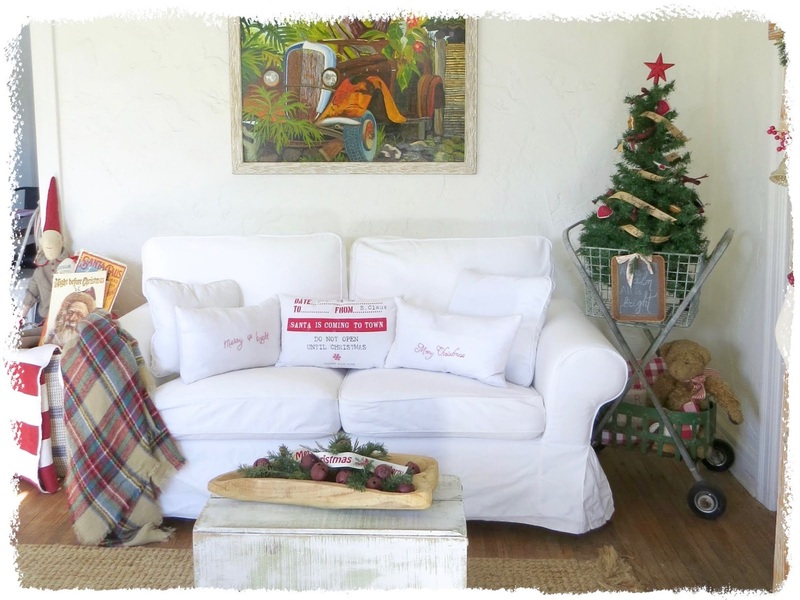 Your home is so gorgeous for Christmas! I wish I could come visit! 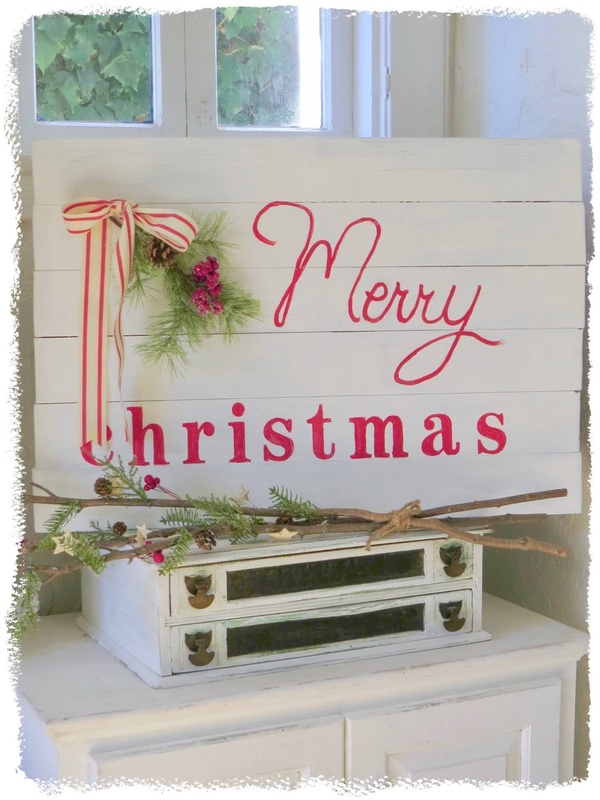 Thank you for joining us this year for the Christmas Tour of Homes! Love , love, love the pixie theme and I agree with Olaf....he needs friends. Every single space, every nook and cranny is just magical. Such a beautiful place to enjoy Christmas. Thanks so much for sharing. Definitely the perfect cottage for Christmas Carol. 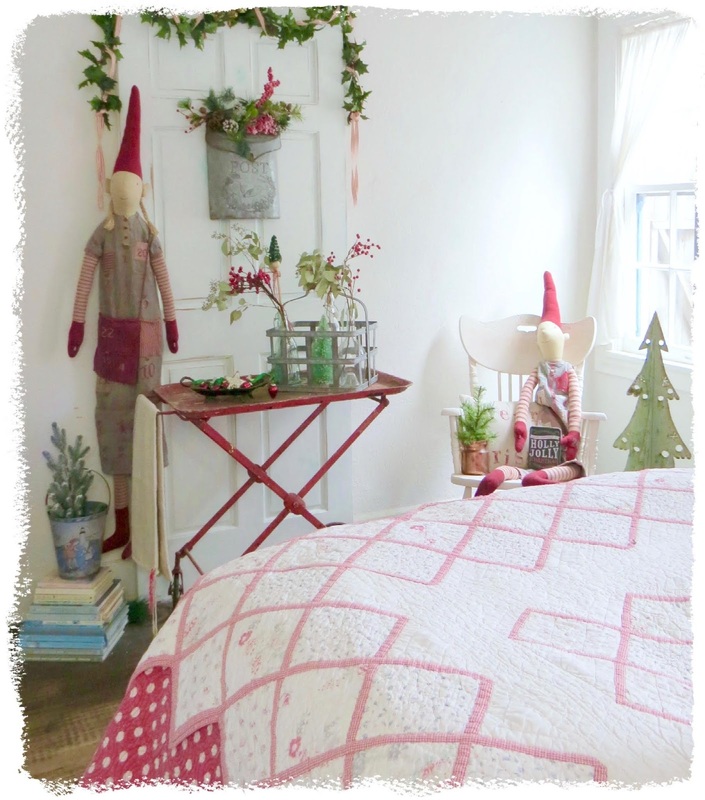 I adore all of your Maileg pixies and the touches of whimsy in every room. Pinning (lots) and sharing on SM. I love it all!! 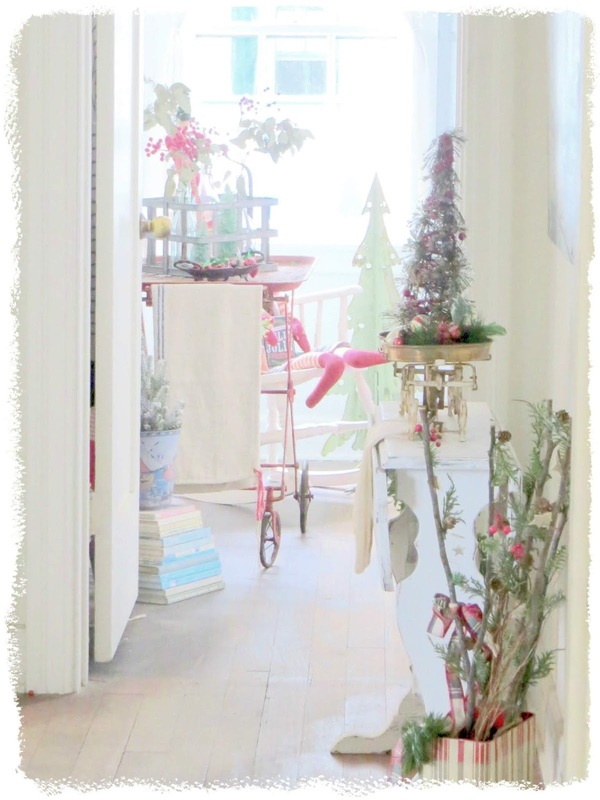 Christmas, Fall, every season - your home is so pretty!!! 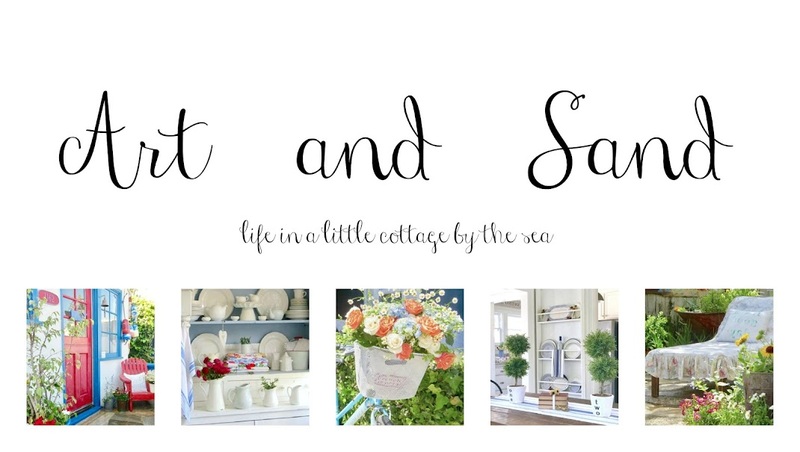 I LOVE your little cottage by the sea, with all your hand-me-down vintage and antique furniture and goodies. And those Pixies are adorable! Thank you again for joining us in our Christmas Tour of Homes 2018. Carol your tour is wonderful as always. I so love that red chair you shuffle around your dreamy cottage. Such treasures to have books from your mom and grandma. 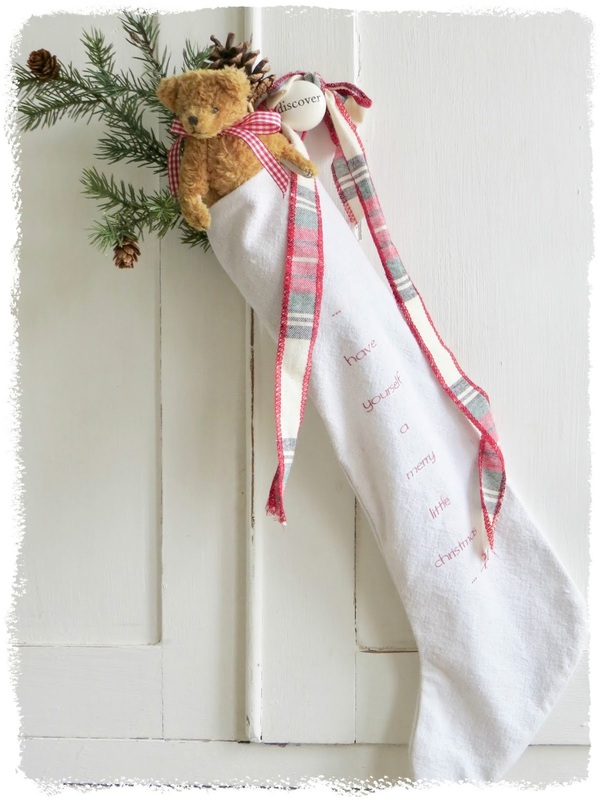 Your cottage is pretty all year long, but especially at Christmas time. Just adorable Carol. 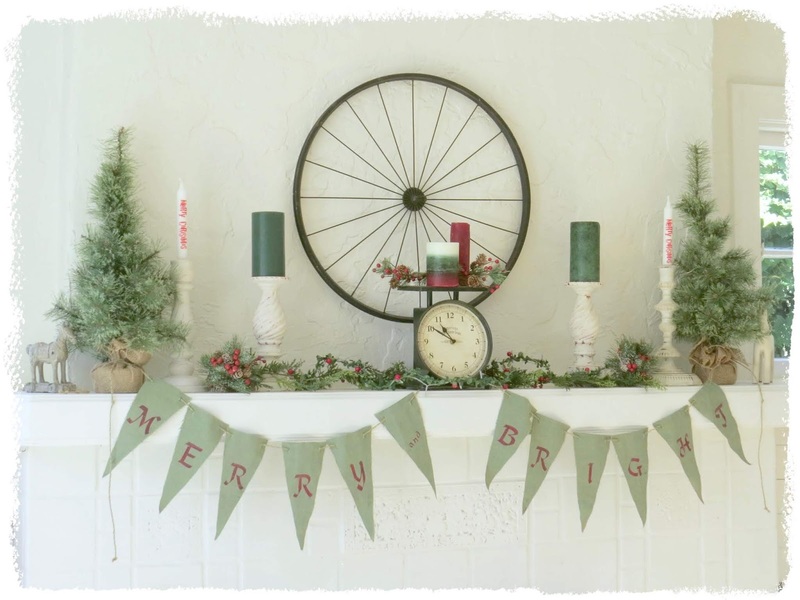 Your sweet cottage looks so pretty and festive for the holidays. Love the new stockings you made. Super cute. Love it all. Dear, dear Carol! WOW!!!!!!!!!!!!!! How happy and bright is your cottage!!!! And I didn't know you had Scandinavian roots! How I love a Scandinavian style Christmas, as well as a British/French style one as well with all the natural elements of the country. And where is Miss LULU and her crush on your Pixies? Enjoy it all my dear. We are loving our cold but beautifully decorated snow landscape! So light and airy and so very pretty! 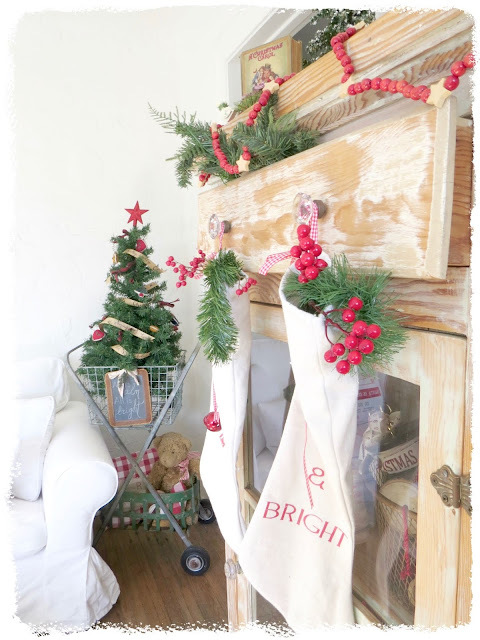 I can tell you put a lot of love and joy into your beautiful holiday home! Absolutely stunning, Carol! 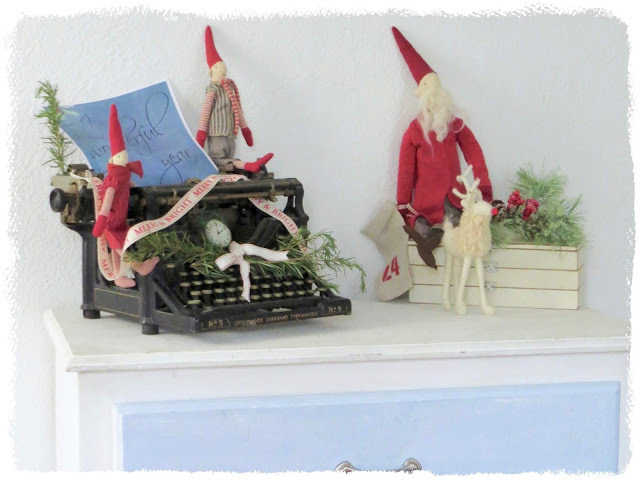 I was recently in a Scandinavian store in Rehoboth, DE and I believe I saw some of those adorable Pixies. I bought several of the Scandinavian kitchen cloths/sponges - one for myself and the rest for gifts. Carol, I have been a big fan of you and your pictures since I first found you on IG. 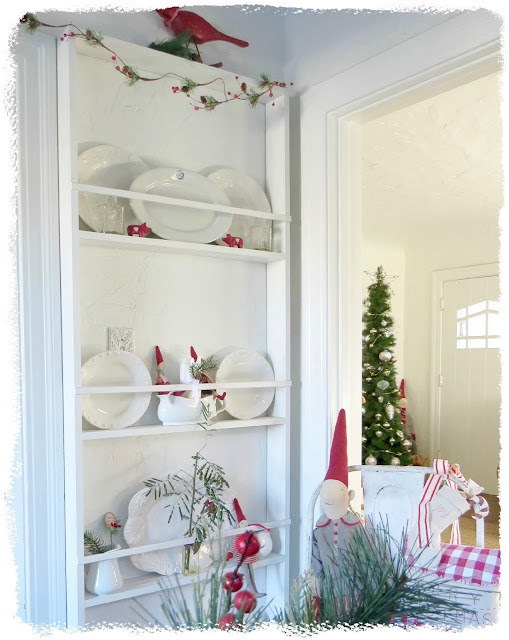 Your Christmas tour is so pretty and I love how you use pops of red in your decor. I also love how you use vintage items in your decor. 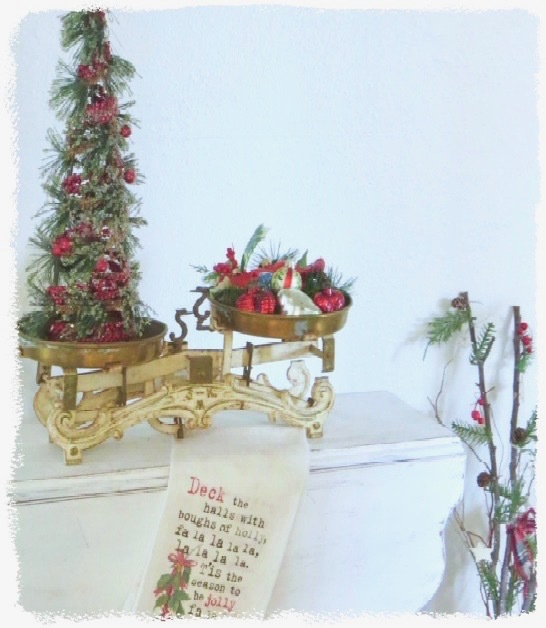 I am so glad that you joined the Christmas Tour of Homes with us! Every room is perfection! I commend you for all the work that went into making your cottage adorable! 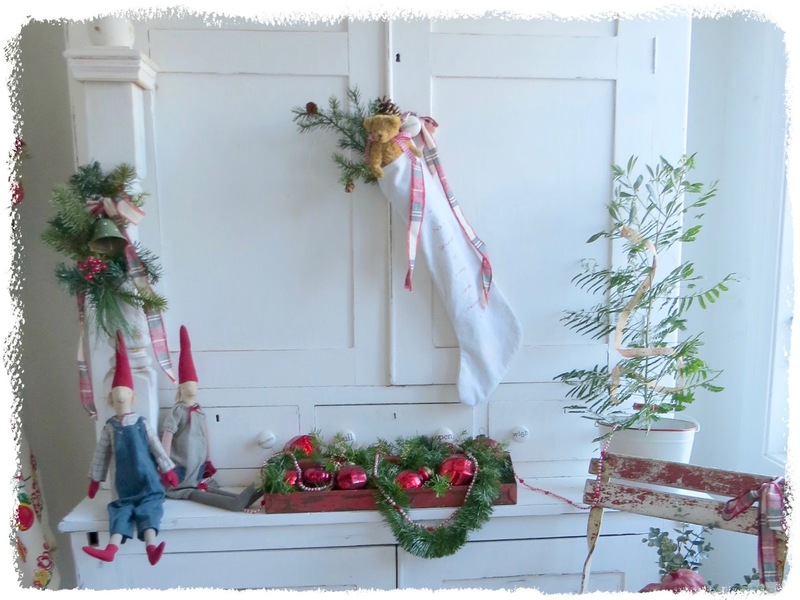 Carol, your cottage is even more enchanting at Christmas! I love your little pixies, and I love your variety of trees! I hope you and yours have a very Merry Christmas! 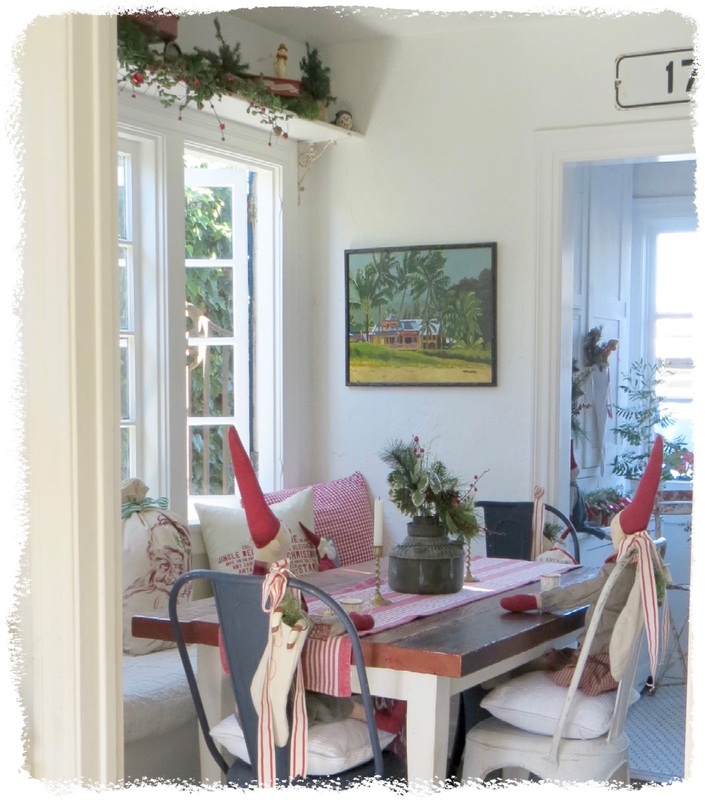 You are so right - your cottage is absolutely perfect for Christmas. So enjoyed the tour! Wishing you and your family a very merry Christmas! Christmas Cottage in California...should be a series on HGTV! Everything is so beautiful; I can't imagine the work spent in doing all this. Yes, it does look like your cottage was made for Christmas, Carol! 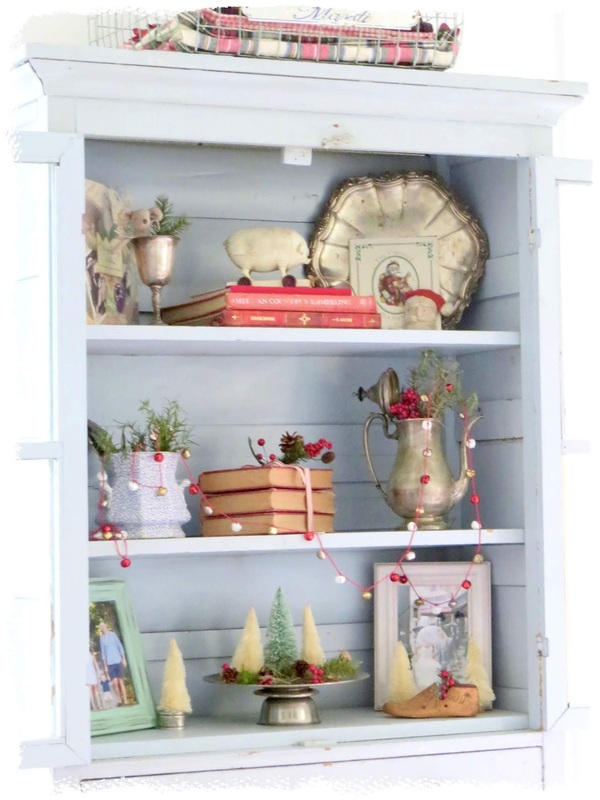 That cupboard from your grandparents and all of the vintage treasures like the old Christmas books are truly remarkable. I could imagine just spending time exploring all of the interesting heirloom pieces in your cottage. So happy to be hopping with you. Happy Holidays! 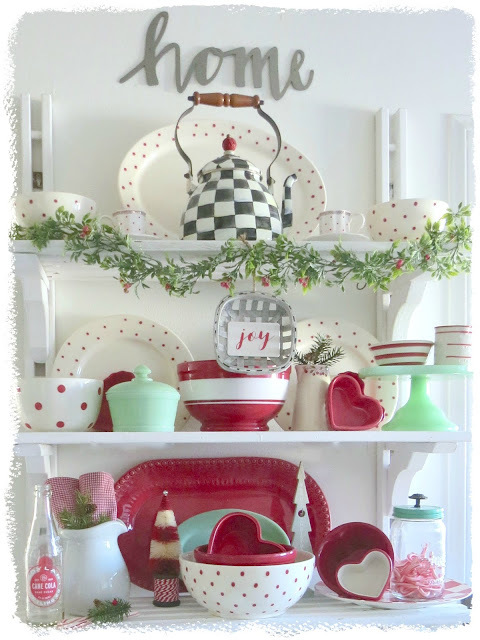 Absolutely darling Carol... every nook and cranny in your home is so charming... love it! Wow! You have so many unique and beautiful pieces, like that grocery cart! LOVE!! 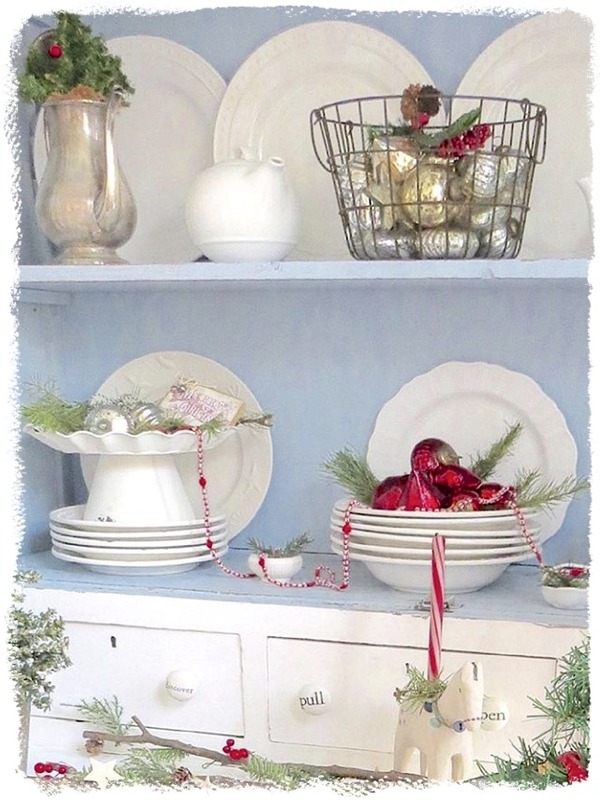 I really like your collection of white and white/red dishes and putting fragile ornaments in the bowls is such a great idea! So beautiful and festive, Carol!! I love all your touches! Your home is so filled with the Christmas spirit. Very pretty! Buy online mithila painting from this website of madhubani painting. The website offers authentic madhubani art. Love this!!! You have such amazing vintage finds, and I love how you have displayed and decorated them throughout your home!